Santa With Gifts is a great Christmas pillow. A Happy Santa stands in the center of the pillow. He is holding a small tree with a star on it, A basket full of toys, a Pineapple, and an American flag rest on his shoulders. A brown field with tiny whites dots surrounds the Santa and basket. A red strip edges the pillow. 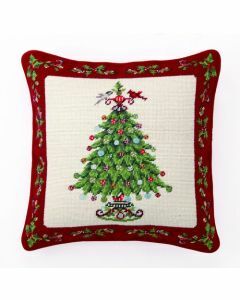 Nice rich colors of reds, greens, yellows, browns, blues, whites, and golds make up this pillow. Colors that match all Christmas decor. Beige cotton velvet zippered back , removable insert. The pillow measures 18" X 18". Click on image for greater detail. Please note there are no returns on holiday merchandise.